David Walley's Hot Springs and Spa Resort in Genoa, Nevada - Near Lake Tahoe - Buy a 7 Night Stay in a Studio, 1 or 2 Bedroom Suite! 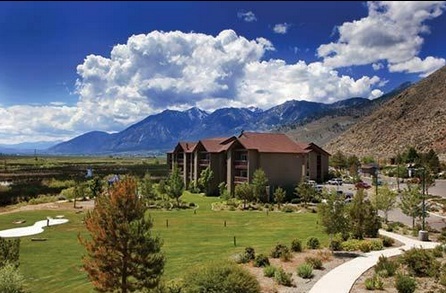 Enjoy 7 Nights at David Walley's Hot Springs and Spa Resort in Genoa, Nevada - Near Lake Tahoe! Nestled in the shadow of the majestic Sierra Nevada, David Walley's Resort is a year-round destination featuring all the amenities of a world-class spa. Relax in one of the six mineral pools or the heated outdoor swimming pool, or pamper yourself with any number of spa treatments from the professional staff. The resort features studios and one- and two-bedroom suites. Championship golf courses are minutes away. Enjoy nearby Lake Tahoe and its exciting nightlife, top-name entertainment, gambling, and water sports. Several convenient ski resorts make winter an especially appealing time. Carson Valley stretches east from the foothills of the majestic Sierra Nevada’s Carson Range to the beautiful Pine Nut Mountains, and south from Carson City to Topaz Lake. Centrally located just 15 miles south of Nevada’s state capital and a 20-minute drive from Lake Tahoe, Carson Valley is recognized as the gem of Northern Nevada – a hidden jewel. Here you can still find miles of open space, expansive ranches and farms, and many historical sites and displays, along with a wealth of outdoor recreation activities still unspoiled by the rapid growth Northern Nevada is experiencing today. Carson Valley encompasses several communities including Genoa, Gardnerville, Minden, and Topaz Lake. The weather is pleasant and the area enjoys four distinct seasons, with temperatures commonly in the 80's and 90's during the summer and, typically, several inches of snow falling over the course of the winter. Comfortable accommodations and attractive furnishings can be found at David Walley’s Resort. Each unit offers fireplaces, television with DVD player, and a telephone. All of these special features await your visit to your home-away-from-home. Your STUDIO UNIT will sleep up to 2 guests. OR UPGRADE TO A 1 BEDROOM SUITE FOR ONLY $75.00 FOR THE ENTIRE WEEK!! OR UPGRADE TO A 2 BEDROOM SUITE FOR ONLY $150.00 FOR THE ENTIRE WEEK! !